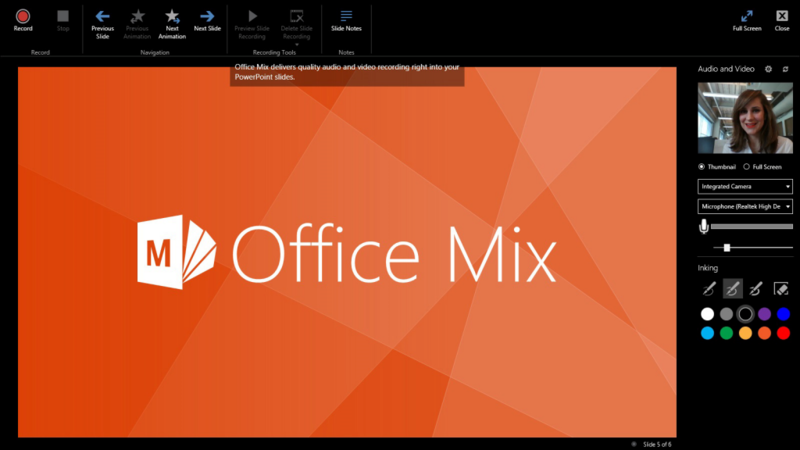 We’re always looking for ways to improve how you can use Office Mix to deliver a compelling presentation and better engage your audience. We’ve done just that with two vital additions to Office Mix, Slide Notes and Closed Captioning. One of the most important aspects of delivering an effective presentation is being adequately prepared and knowledgeable enough to adapt on-the-fly. You may remember a presentation technique taught to us in grade school, which is to rely on notecards to ensure you hit your most salient points. With Slide Notes, the concept and experience are much the same. 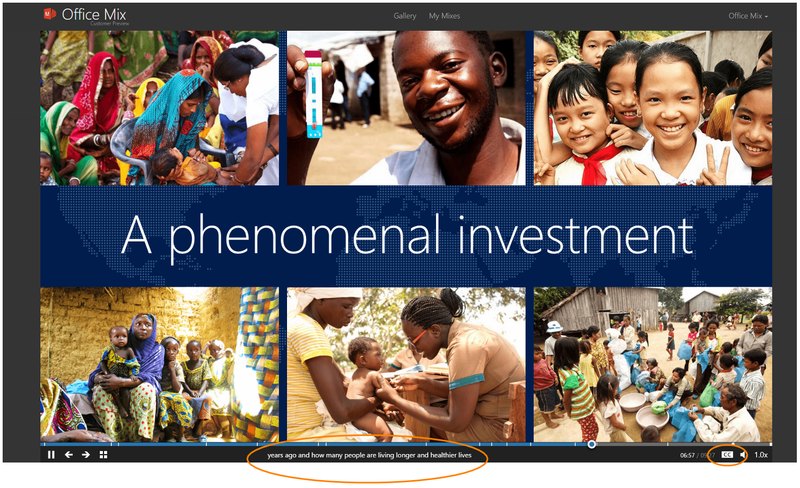 When you click the MIX tab in the PowerPoint ribbon, and then click the Record button, the recording view will open and the Slide Notes translucent text box is displayed at the top of your screen. Think of Slide Notes as a teleprompter for recording a mix—so you can focus on connecting with your audience, rather than worrying about memorizing your delivery. Your presentation will have smoother transitions, and you’ll record in fewer attempts. We think you’ll love this feature! 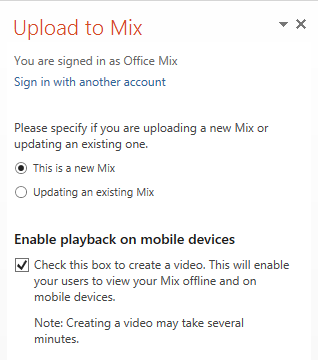 We are also delighted to announce closed captioning for Office Mix! Our mission is to empower you to reach your full potential. With closed captioning, you now have the ability to personalize your Office Mix experience to make it easier to see, hear, and use. Beyond supporting those who are hearing-impaired, closed captioning can supplement audio that is hard to understand. Additionally, captions can be used as a tool for those learning to read or by individuals who simply like to read a transcript along with the presentation. Offering closed captioning in Office Mix reaches beyond merely satisfying some of our customer’s legal requirements—it’s a remarkable learning aid. Closed captioning allows you to observe and absorb presentations without interrupting or being interrupted by the world around you. It enhances the experience whether you are in a location that is busy and loud, like a subway or a public square, or tranquil like a library, or at home in front of the TV. Closed captioning can be effective in reinforcing key points or to improve your audience’s comprehension of the material. Although closed captioning in and of itself is nothing new, its utilization in Office Mix is a welcomed addition. To add closed captioning to a mix, ensure you check the box to create a video when uploading a mix. Then, download the video and utilize a third-party service to create the TTML file from your video. Once your TTML file is ready, go to your mix details, select the Upload TTML File link and upload your closed caption file. From there, preview your mix to ensure your closed captioning is presented as you intended. For detailed instructions, read our Knowledge Base article. Office Mix is purpose-built to give audiences an engaging presentation that can be accessed at their convenience, and on their favorite device. These are just two of the great features we’ve launched to improve the experience for both presenter and viewer.